See how people have got into their current roles; what they’ve done and where they’ve worked before. This could help you identify organisations which may have opportunities in your sectors of interest. You may find someone doing your dream job or working at your dream organisation. You could try contacting them to ask for advice on getting into that field or work with that organisation. People are generally willing to help – particularly when you have a shared connection such as attending the same university. If you are contacting people, I’d suggest trying an informational interview initially. Check out our short guide for doing this effectively. 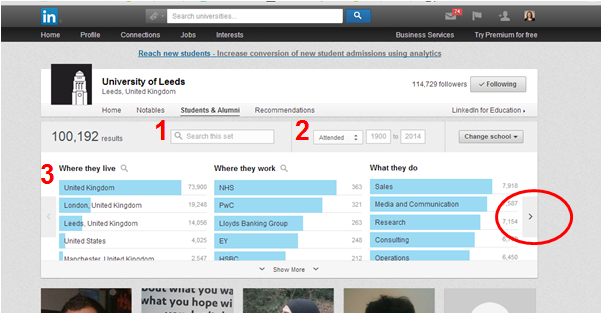 Here you can see there are currently over 100,000 alumni from the University of Leeds on LinkedIn™ (although this figure will include current students too). You have the option of filtering the results by various criteria. This includes searching by keyword (1), for example a particular subject, employer, job title (or anything else), by when they attended (2), or by where they live, work or what they do (3). 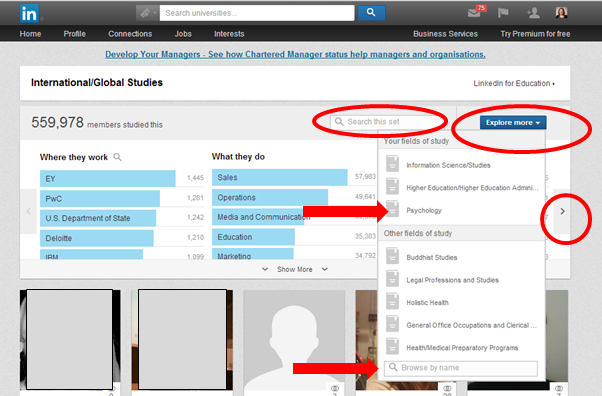 Note the little ‘>’ circled, this gives you further filtering options including what they studied and their skills. What to get a bigger picture? As noted above, you can see results for other institutions by using ‘Change School’ in the alumni tool. But what about if you want to look at graduates of all universities at once? 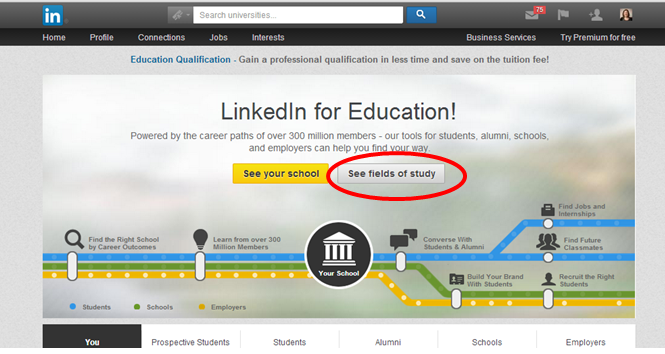 LinkedIn have recently added a feature to do this, called ‘Fields of study’ which works in a similar way to the alumni tool. Results default to the subject of the first entry in the Education section of your profile. This isn’t necessarily the most relevant. For example, my default results, as you can see below, are for ‘International/ Global studies’. This default is based on the fact that the first thing in my education section is the International Baccalaureate that I did at college, so is a bit of a mismatch in my case. See “The best way to network with alumni on LinkedIn” on the LinkedIn™ official blog. Remember, the Leeds Network is a fantastic resource to help you identify and contact Leeds Alumni. Managed by the university, it can connect you to 100s of Alumni who are interested in sharing their tips and advice with current students. You might also want to take a look at the “Graduate Destinations” information on our website.